Has she fled to Canada? Is she wandering the woods of Chappaqua? Is she holed up with Richard Simmons? No, no, and *shudder* thank God no! Yes, I managed to find the time to photoshop my head onto a waldo illustration. I DON’T WANT TO LIVE IN A WORLD WHERE THERE ISN’T TIME FOR THAT! No, rather she is KNEE DEEP in envelope samples, logo designs, print runs, branded stickers, merchandise photography . . .
It’s full-blown ETSY SHOP SETUP over here! Nearly seven weeks ago (!!) I wrote about how I was reluctantly going to setup a shop to sell my bird prints and such. Wow, a lot can change in seven weeks. If you had told me that by April 1st I’d eagerly be entering data into a PROFIT AND LOSS spreadsheet I would have laughed out loud. Truly. And yet here I am. Not just casually getting a few prints made (which would be fine) and slapping a few up on Etsy. No, I have fully immersed myself in the venture. Branding! Product! Profit Margins! Search Engine Optimization! Suppliers! It is nothing short of delightful. I never knew that I had this entrepreneur energy within. I spend every spare moment working on this (hence the lack of blogging). Yes, it has truly been a year full of continual unfolding that surprises and delights. I look back to where I was a year ago: broken-hearted, cying-while-I-sang-in-the-church-choir, painting birds. Hot damn that was a tough year–but all that hard inner-work is finally bearing fruit. Who knows what the next year will bring. So yes, the answer to Where is Sarah? is that she blissfully creating and ever-so-eager to launch her Etsy shop. I cannot wait to share this with you all very soon! Until then, if you’ll excuse me, those profit-loss spreadsheets won’t calculate themselves. A few months ago my friend gave me a plumeria cutting. Even if you have never heard of Plumeria I guarantee you have seen their blossoms: they produce the beautiful flowers that are used in making Hawaiian leis. That photo isn’t of my actual stick but I can promise you it looked just like that photo. I didn’t think to take a picture of it, likely because I did not think it would grow. I mean it is a stick. A stick that is supposed to grow into an exotic tropical flower plant. I have never grown a plant from cutting, let alone a fancy pants tropical tree. Well, I love a good challenge. I decided what the heck, I would try to grow it. I bought root hormone (who knew such a thing existed), followed some youtube videos on the topic, placed it in a semi-sunny and not too wet region of my lanai, and I left it alone. This is very important according to the horticulturist from Hawaii who is on YouTube. 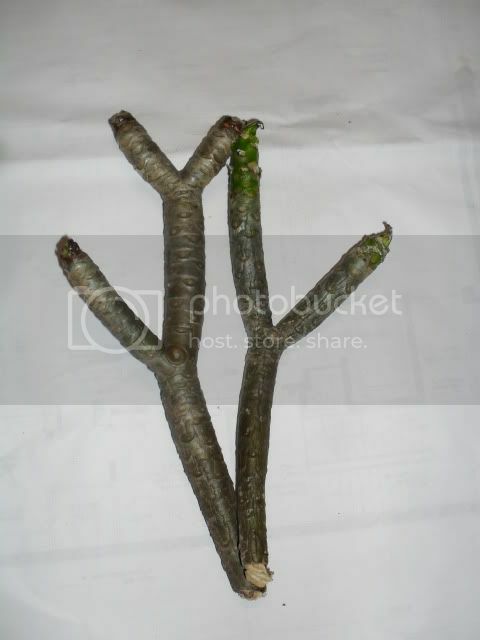 He grows hundreds of these sticks cuttings. Leave it alone! he told me. Do not pull or tug or mess with it! (How did he know that is exactly what I would have done??) The fragile roots need lots of time to grow and grow and grow. I left it alone. It was so hard but I did not poke or tug or anything. About a month or two later a leaf appeared. I went bananas bonkers. Oh my goodness it was growing!! 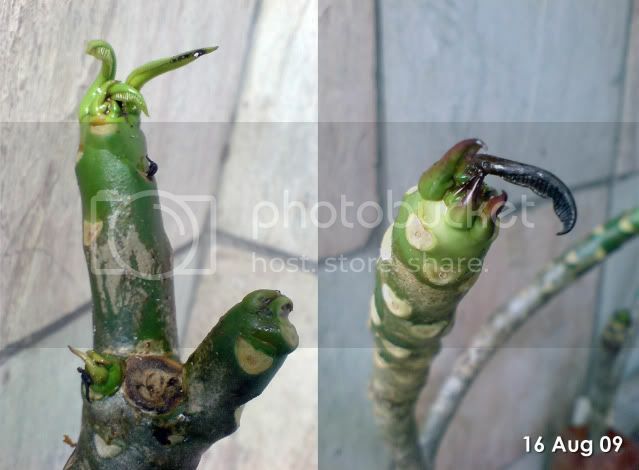 Photo source.. Not my stick with a tiny leaf but it looked just like this. Wow right? Look at all those huge tropically leaves! It is amazing. Keep the faith. So often when we feed a garden, whether inner or outer, it can feel like nothing is happening. And then, boom, growth. *I just accidentally typed “placed into soul” instead of “soul” – revealing no? I’m currently reading this little gem of a book called Anam Cara by John O’Donohue. It’s a compilation of Celtic wisdom on the themes of friendship, solitude, love, and death. One passage in particular really resonated with me. O’Donohue describes the Celts’ wonderful intuition for life; how they respect the circle of the seasons and understand that the rhythms in nature are also active in our own hearts. How there is wisdom in surrendering to whatever season we find ourselves in. I have no doubt that releasing this grief has healed me in ways I could never have expected, and I’m certainly grateful for the fruits of the painful passage. That being said, I’m more than ready to move on to the next season of my heart. In January when I found out I was pregnant, I was elated. In an amazing twist of fate, my due date was the date of my mother’s passing. How beautiful, I thought. New life literally springing forth after a season of loss. But then I miscarried. It is an understatement to say that I was devastated. I thought, really universe, more grief and loss? I have tired of this landscape. I know my husband is beyond tired of this landscape. The whole experience has rattled me and made me question whether I can trust that “this too will pass.” What is next, I bitterly ask. CC license, photo courtesy of Pexels. I may not like that I still find myself in winter, but for now I will do my best to surrender to it. When I am impatient, I will remind myself that ultimately it is a season. Seasons cannot be fought or battled, but simply weathered. Seasons are not personal. Yes, it may require bending and weaving with the wind for a bit, but the wind will eventually stop, and balance will return again. You may also enjoy An Ocean of Tears Larger than the Four Oceans.